Producing high-quality products at lower production costs is one of the prime objectives of modern manufacturers. Competitive industrial environments make it mandatory for many companies to use the latest technologies to meet market expectations and improve profitability. Automated or robotic welding systems are crucial for some industries such as fabrication and manufacturing. It is hard to imagine an advanced production facility with manual or traditional tools. Companies continuously watch out for quality and productivity. Minimizing defects and increasing throughput are two of the key strategies to achieve higher productivity. Smart manufacturing tools like robots and sensors play a vital role in helping companies achieve their business goals. Whether you run a small shop or a large manufacturing plant, turning to intelligent machines is an excellent way to achieve sustainable growth. Millions of products require welding operations in their production process. The quality of your welding operations has a major effect on the quality of finished products. As a business, you need to consider a number of factors before implementing a robotic cell. Planning is absolutely necessary to use new technology in an efficient and profitable manner. The output of an automated welding unit largely depends on the parts fed into it. Accurate and repeatable part designs are necessary to take advantage of these systems. Poor fit-up, gaps, or poor joint access will make it difficult for you to generate a higher return on your investment. 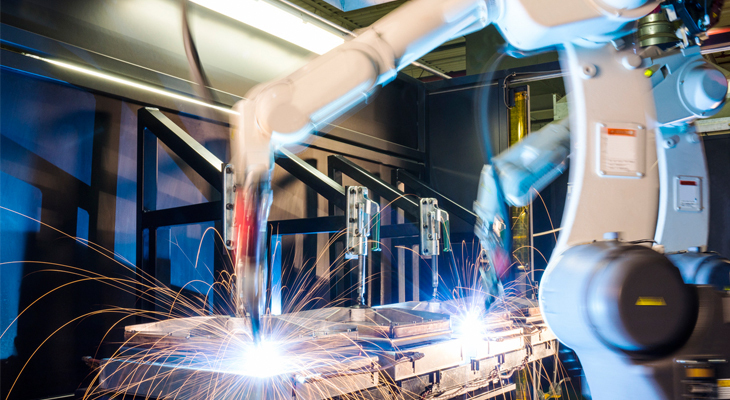 These limitations can prevent robotic welding cells from completing jobs effectively and appropriately. Simple part designs enable an automated welding unit to execute the same weld repeatedly. Manufacturers should not process part designs that demand intricate clamping or tooling to hold pieces in place. It will make the welding process inefficient and increase production cost. It is also important to ensure consistent process flow by assessing the overall welding process. Bottlenecks make the movement of parts slow and hinder the ability of a system to perform to its full potential. Therefore, it is critical to prepare and plan before implementing a certain type of welding cell. Peripherals are any additional tool integrated into a robotic welding cell to increase its overall performance. For example, a spatter cleaner, wire cutters, anti-spatter sprayers, and neck alignment are some of the additional tools that maximize the operational efficiency of a system. While peripherals can help reduce the downtime and rework and increase productivity, some businesses undermine the significance of peripherals. Quality Millwright is a well versed and experienced millwright company in Edmonton where we provide machining and fabrication services to a number of different industries. Our objective is to implement advanced welding and machining solutions to produce the best results for our clients. Contact us to know more about our fabrication and machining expertise!